Pioneers in the industry, we offer air solenoid valves from India. Optimizing the latest technology, we are distributing a range of Air Solenoid Valves that are configured from optimum grade raw material. These valves are used to control the flow of hydraulic fluid in various industries such as an automobile, engineering, and others. Designed with precision, our range of valves ensure sturdiness, high performance, and long service life. Available in various models and specifications, these can also be custom designed as per the desired specifications of the clients. 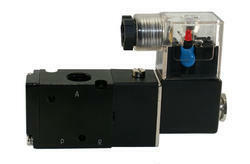 Looking for Air Solenoid Valves ?